What would it look like to give up control of what and how much your children eat? Does letting go of controlling their eating scare you? Are you not sure why this would be beneficial? What if it meant that you got to put one meal on the table, got to sit down with your kids and actually enjoy the meals? If that sounds like something you’ve been longing for with your kids then read on! Children are naturally intuitive eaters when we let them listen to their bodies. Part of this is allowing your children to decide what and how much to eat from what is served. This does not mean opening up the cabinets and giving them free rein of everything and anything; this means they get to choose what to eat from what is served. Realistically, children can not be responsible for getting variety on the table because they don’t understand what that looks like. They will do best by relying on us to do our job with feeding. This means us deciding what to serve on the table, when to serve the food and where to serve the food at. This brings me to their job. What would it mean to let your children listen to their bodies, eat what their bodies need and then stop when they are full? It would mean raising an intuitive eater – with a good relationship with food! When I first present this idea to parents I often get some push back, but this stems from misunderstanding of the concept. It’s true, if we ask children what they want, especially in their early years, they will lack variety, likely pick the same foods and struggle nutritionally. 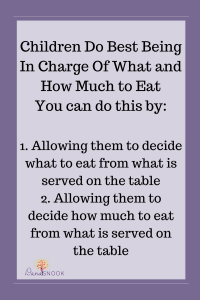 However, if we do our job as the parent and make the decision of what to serve on the table, we can then step back and allow our children to decide what to eat from what we put on the table. They will eat better and rely on their intuition to eat exactly what they need to grow well. Client: What if all they eat is the rice…or fruit? What if they only eat carbs and no protein? Me: Then it likely means that is all they need at that meal. Yes, children may only eat the fruit or rice or the chicken, but when we allow them to take the lead they will get exactly what they need. I’ve noticed personally when my daughter is going through a growth spurt she will eat much more protein than carbohydrates, and that when she isn’t she eats more carbohydrates than protein. You may start to notice a pattern with your children too. Client: Is my child really going to choose fruit if they can have something else that tastes better? Me: Yes, it doesn’t happen right away, but once your child trusts you to know they eat what and as much as they want, they will get to learn to eat more intuitively. I want to share a personal example for you. (Disclaimer: My daughter has been taught to be an intuitive eater since infancy so if you have been interfering it may take some time and trust for your child to get here). Last week we were traveling in Arizona so we ate out a lot. I let my daughter manage her appetite and allowed her to choose what to order. This is a picture of her right after her food was put down. 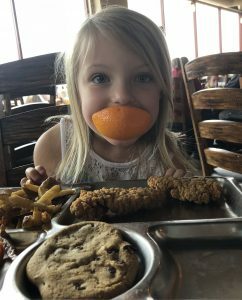 The first thing she picked up to eat was the orange even though there was a cookie, chicken tenders and french fries. The reality is that we aren’t able to police how much our children need because we don’t live in their bodies. They are the only ones that know exactly how much their body needs from meal to meal or day to day. 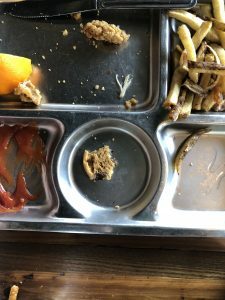 If you ask them to eat one more bite or finish what is on their plate, you could be teaching them to eat more than their body needs (AKA “overeating”). While you may have a good reasons around this it can interfere with them learning to eat intuitively. Requiring them to eat two more bites of one food before they can have more of another food is also interfering with them listening to their body and how much to eat. Let me explain it this way. If your child’s body really needs vitamin C today for some reason – they have eaten all their oranges and are asking for more, but haven’t eaten anything else on their plate. You ask them to eat chicken before they can have more oranges. They might do it, but could be full by doing so. They will still eat more oranges because their body really needed them – this could leave them eating more than their body wanted to get the nutrients they need. Desserts- this one makes parents really nervous to think their children can’t manage them. Believe me they can. They can learn to stop when they are done with them too! It takes lots of trust, but when your child stops and says they are full when they are full, it’s amazing to see they truly can learn to be intuitive eaters. 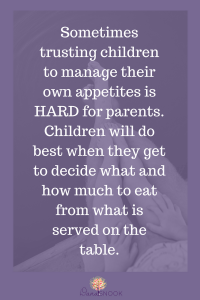 Sometimes trusting children to manage their own appetites is HARD for parents. It does require parents to evaluate their own attitudes towards certain foods or food rules. However, as I always say..In order to raise children with a healthy relationship with food, we do have to work on our own relationship with food too!